Home > Guests and Gifts > Invite Children or Not? If you tell your guests not to bring their children, you are asking them to make other arrangements for their offspring. Finding a babysitter or alternative childcare can be an inconvenience, and for some invitees this can mean they will decline the invitation to your wedding. If you don’t mind the smaller guest list, or have no close friends or family with children, this could work really well. But if you’re close loved ones have children and you really want them to be there on your big day, it might be worth considering inviting their children as well, to encourage them to attend. If you decide to invite children to your wedding, it would be a kind gesture to provide entertainment and a certain amount of supervision for them. The majority of young children will require special meals, and without some amount of entertainment to keep them occupied you may find that little ones become noisy, distracted, and begin to disrupt your big day. Some great options for children’s entertainment at a wedding are magicians, craft tables, and you can even consider having a separate children’s table for the kids to eat and play away from the adults. Be aware that you may need to hire someone to supervise this table though, and the additional expense that would add to your big day. Most venues will offer a smaller sized portion of the adult meal, at a reduced price, for your younger guests. Many parents would prefer this to a 'junk' type option such as chicken nuggets, but if in doubt, ask! You could also include information about the children’s menu with your invitations to families with little ones, so the parents will know exactly what the options are, and what ingredients will be included. This will minimise any fuss or misunderstanding, and ensure that your caterers know what they’re expected to provide with plenty of notice. 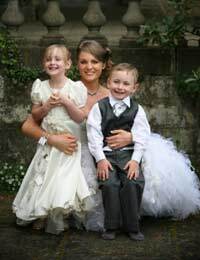 Do you imagine a cute flower girl or tiny page boy forming part of your wedding party? If so then you are opening yourself up for criticism if you choose to have a child-free wedding. As far as etiquette is concerned, this is a black and white issue: If you are excluding some children, the rule is that you must exclude all children. There must not be different rules for different people or some individuals may be offended. If you decide not to invite children to your wedding some of your guests may regard this request as an attack on their family, even if it's not. The best way to overcome this is to outline a clear and valid reason for why you have decided not to invite children to attend your wedding. An easy option for this is to explain that you are looking for a grown up feel to the event, or explain that something about the setting or ceremony is inappropriate for children. Indicate that the reception is to be adults only by having the words "Adults Only Reception" or "Adult Reception" printed onto the invitation. Don’t, however, say “No children” or anything exclusive that might cause additional offence. Make sure you have this decision made before your invitations are printed: writing “Adult Only Reception” on your invites by hand could cause additional offence, as the invitee could perceive this to be an afterthought designed to exclude their children, rather than all children.